Where Sky's the Limit in Imagination! Magic Sky’s ballet class will build confidence and foster a love of dance. Children will plie, twirl and twist in their tutus with the help of an experienced dance teacher. Your child will learn the basic techniques of ballet, improve balance and coordination and strength, using playful techniques along with music and games. Please wear leotards and ballet slippers. Mommy & Me parents are required to participate. Preschool Prep is an hour-long class that will encourage your child’s love of learning. Activities are designed to develop social skills, independence, fine and gross motor skills, basic academics, and allows children and parents to separate gradually. Preschool Prep is taught by an experienced Preschool teacher and the focus is fun! We will guide children through activities such as music, art, movement, imaginative play, and a group snack. Does your child enjoy building with Lego's. What if they could bring them to life with simple coding? A & E Learning Center presents STEMbotics LEGO Robotics at Magic Sky Play. Children work in pairs using step by step instructions to build Lego models with motors, gears and sensors and then animate them using LEGO's coding App. Dress for a mess and artistic success! This class introduces young artists to an exciting variety of sensory experiences. 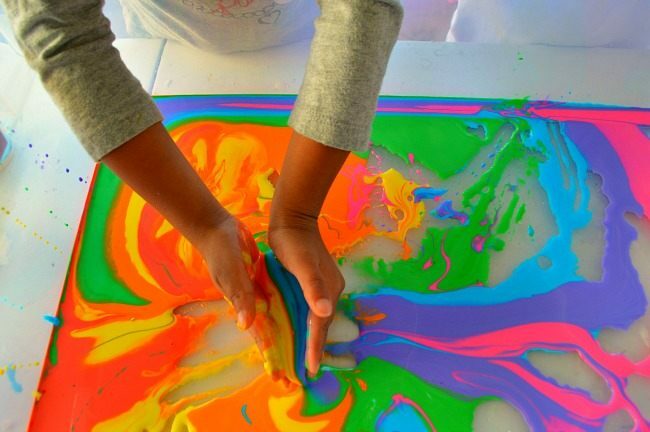 Children will be able to smear, squeeze, splatter and discover different art materials. Each week we will introduce exciting new themes that include paint, sculpting paint, sculpting dough, crayons, chalk, and collage. Get ready for a messy good time! Soccer shots mini is a high energy program introducing children to fundamental soccer principles, such as using your feet, dribbling and the basic rules of the game. Through fun games, songs and positive reinforcement, children will begin to experience the joy of playing soccer and being active. Each child receives an Adidas Soccer Shots jersey.